A History of Christianity in fifteen objects will be hosted by the Church of St. Peter and St. Paul in Deddington. Click here for the Church website. The Church will provide refreshments before and after each talk. Disabled access and toilets are available. The main entrance to the church is through the south door. The pathway slopes up to the door, but there are no steps and although there is a very slight lip against which the outer doors close this is no obstacle to a wheel chair, mobility scooter or a pedestrian with limited movement. The Church has a hearing loop system. 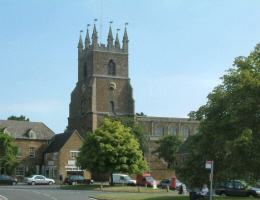 Deddington has plenty of parking near to the Church and the village is also well served by buses from both Banbury and Oxford. All are welcome, admission is free and we look forward to meeting you for the first talk in September 2011.